There are times when some patients, despite their doctor’s best efforts, are left with some level of visual impairment. This often seems to make reading, writing and doing everyday tasks almost impossible. Our trained occupational therapists work with people in their own homes. They can teach people who have limited vision new ways to do everyday tasks and introduce them to some simple adaptive equipment that can make doing things a lot easier. We increase the independence and safety of people who have macular degeneration, glaucoma or diabetic retinopathy. Visions of Independence helps people who have vision loss live their lives and gives them new hope. 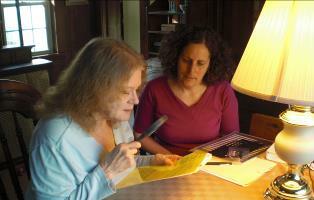 We connect low vision patients to programs and services that can be very helpful. Almost all of these programs are free. The challenge is that few people know that there is help and services available to help them reclaim their lives. Our services are almost always covered by Medicare, HMO's and other insurance programs. We, at Visions of Independence, know that some little changes in the way visually impaired people do things can significantly increase their independence and safety.